• Summary: Biking from SiemReap to Saigon in 09 days with Vietnam Adventure Cycling tour , cyclists could see the Great Angkor and its friendly peolpe in the Kingdom of Cambodia, kingdom of wonder and enjoy the boat trip to visit the floating village on The largest freshwater lake in Southeast of Asia.The Royal palace and the Killing Fields will be never forgotten.Exploring the Mekong River from PhnomPenh to Chau Doc by boat and stay a night in border town. 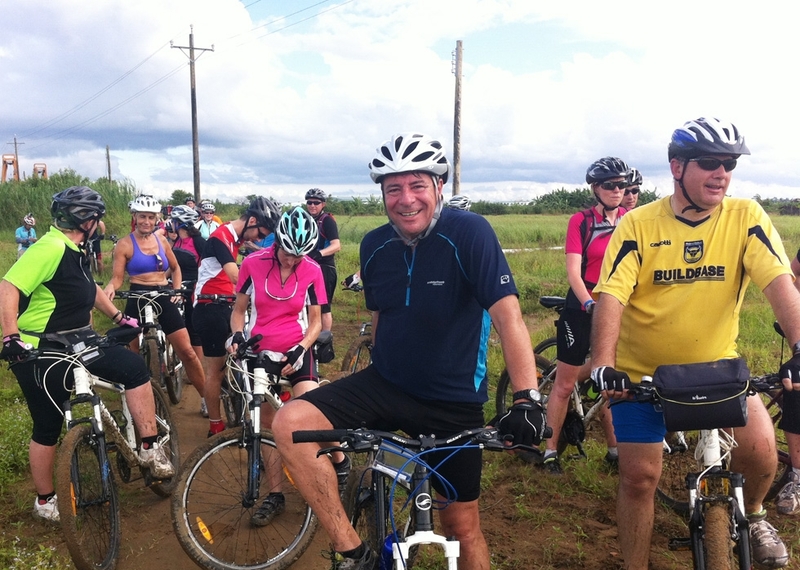 Meandering of the Mekong Delta by biking in a few days before you finishing your trip in Ho Chi Minh city. DAY 1: SIEMREAP- ANGKOR COMPLEX . 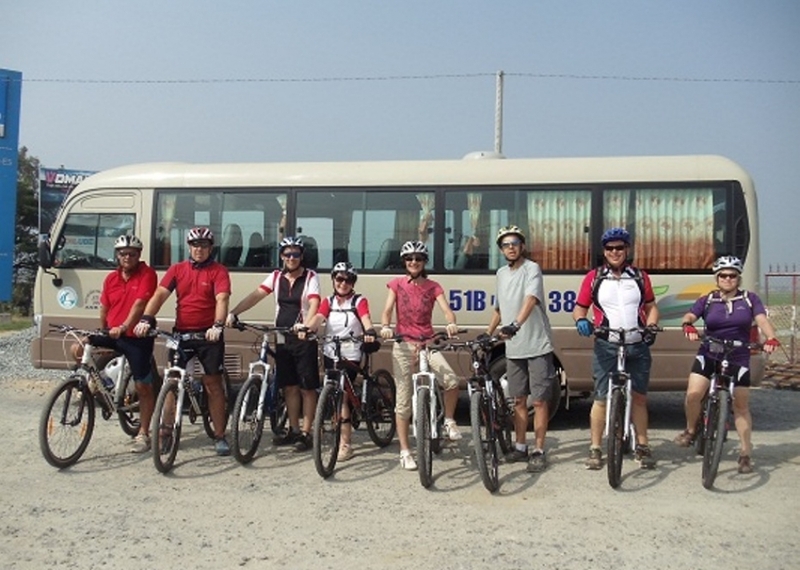 Vietnam Adventure Cycling Guide will pick you up at the hotel for the cycling to Angkor temple. The Cycling will start with a bit busy road before we heading to village cycling on shady bumpy road and follow the single trail inside the jungle to see the real life of the local people living around the temple , and the cycling trail will take you to the Angkor Thom( Bayon Temle), the multitude of serene and smiling stone faces on the many towers which jut out from the upper terrace and cluster around its central peak. sightseeing at the temple before get on the bike hit the road to another famous Temple, Ta Phrom, embraced by the roots of enormous fig trees and gigantic creepers. Spend an hour on visiting Ta Phrom. It was built in 12th century by the famous King Jayavarvan VII indicated to his mother. 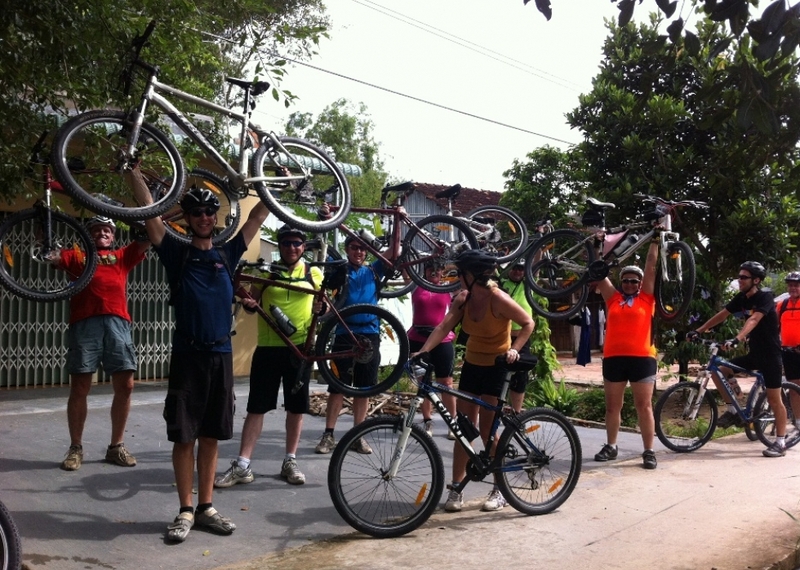 Start your second days of the trip is cycling west to Banteay Srei. Bike on beautiful rural road as you can see real countryside of Cambodia including; rice field, typical villages and pagoda. Arrive in Banteay Srei before lunch. Visit Banteay Srei temple known as women citadel (built in 967 A.D dedicated to Brahma). With the pink sandstone walls and the best carving of all, Banteay Srei has attracted many tourists when coming to Siem Reap. 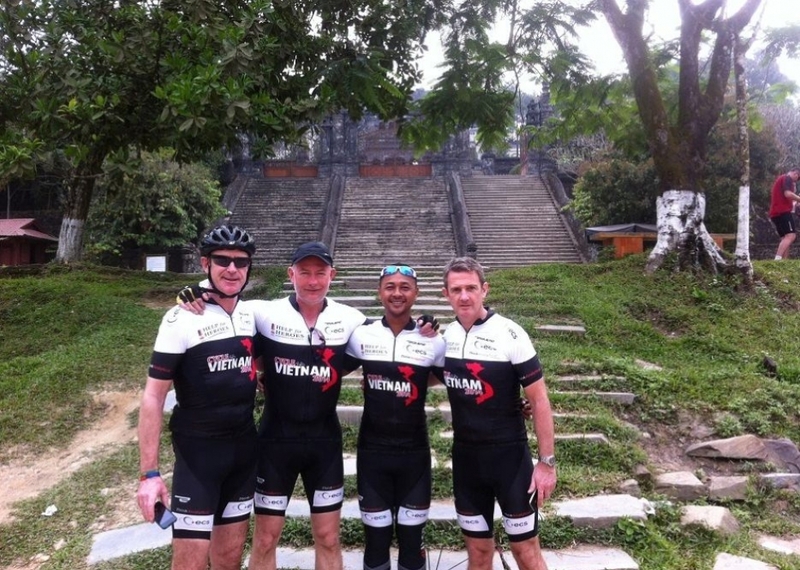 Continue biking to visit Kbal Spean, the River of Thousands Lingas. On the way back to Siem Reap city, make a stop to visit Landmine Museum of Mr Akira. Mr Ra is dedicated his life to clear the landmines in countryside of the country. Overnight in Siem Reap. 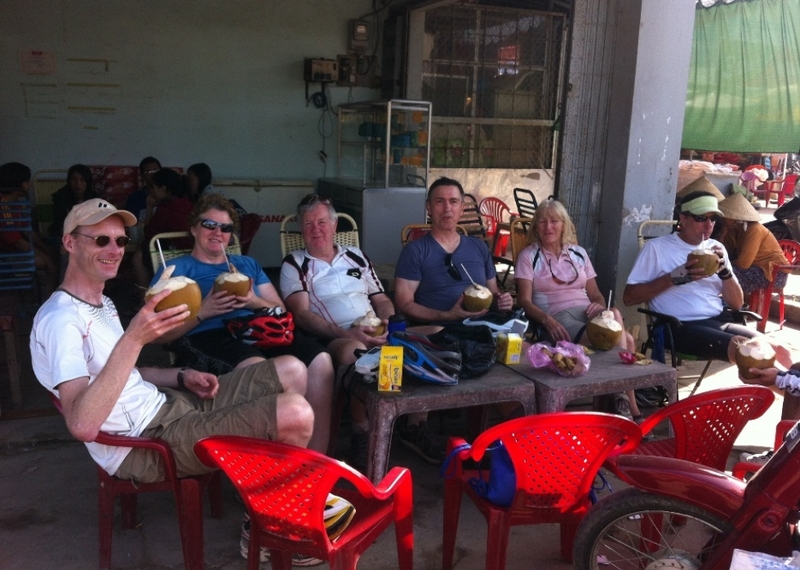 After the breakfast at the hotel,we cycling throught the village via the small dirty road to Rolous Group, it was the first capital of Angkor Empire during 800 A.D. Visit the Pre-Angkorian temples including Preak Ko, Bakong and Lo Lei. In the afternoon, ride to Tonle Sap Lake where you will have a boat ride to the floating village on the largest freshwater lake in southeast Asia. your boat will goes slowly so that you could see and take many photos as you can. Have luch on floating restaurant and cycling back to hotel. Stay one more night in Siem Reap. A short transfer to high speed boat station for getting on board to Phnom Penh. This boat trip takes 6 hours to Phnom Penh. Today you will have an opportunity to own a collection of photos which is about ordinary life style of locals living on Tonle Sap. In rainy season, Tonle Sap Lake reaches 10,000 square Km and it\'s got only 6,000 square Km in dry season. Arrive in Phnom Penh port get on the van transfer to hotel for checking in and visit Royal Palace, Silver Pagoda in the afternoon. Overnight in Phnom Penh. The Cheung Ek killing field which is 15 km from The center will starting your day after breakfast at the hotel you will have a chance to understand more about the darkness period in Cambodia from 1975 until 1979. Have lunck and leave Phnom Penh for Chau Doc by high speed boat. All will be at boat station by Mekong River in Phnom Penh city at 11:00 am. Relax on boat downstream on Mekong River to Vinh Xuong border gate. Then continue your boat ride to Chau Doc smuggling town, Vietnam. After breakfast, we leave for the floating houses on upper Mekong river by boat where we can see plenty of catfishes, red snappers… breeding under right their houses. What is an amazing life! Then keep boating to visit the Cham village with about 12.000 people who those are weaving sarongs, hats…by hands as keeping their ancestral tradition. Walk to the mosques that Muslims pray and teach Cham kids in Arabic for a while. Then we start cycling along incredible country roads from Chau Doc to Bachuc along the border, or re-trace back to triton (depending on road conditions). The cycling starts to gently undulate and mountains begin to loom as you ride out off Chau Doc. The presence of Thnot trees indicates the growing proximity to Cambodia and the local people speak Vietnamese as their second lanaguge. This afternoon, you will cycle to the killing fields of Vietnam at Bachuc, where Polpot’s regime massacred over 3,000 Vietnamese in 1978. 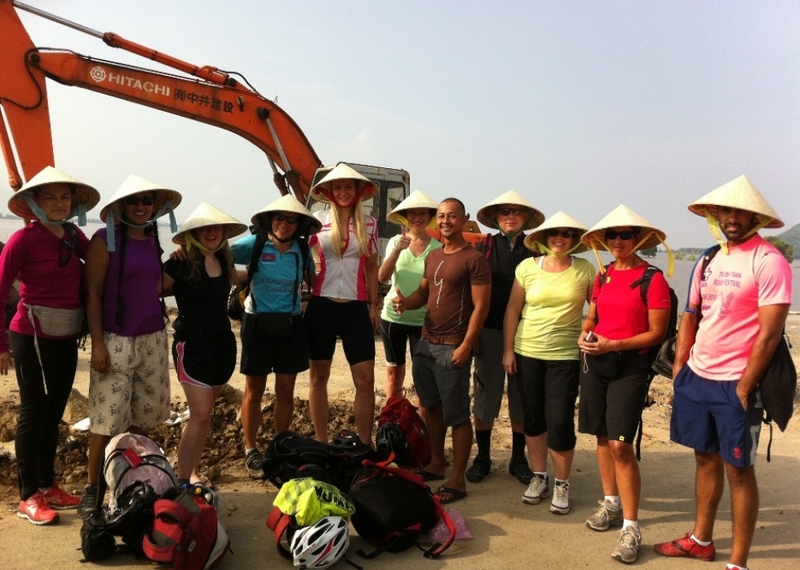 Our final cycling to Longxuyen, the scenery is completely different. Overnight in Longxuyen. The cycling day will start with a short transfer out of the busy city , you will cycle on a tiny road or concrete road build by the contribution 50% from the villager and 50% by the gorverment along the canal to see the bird santurary today you will feeling tired not from the cycling but because all the chilrent come out and say hello. Having luch and keep cycling to Cantho city. Overnight in Can Tho. After breakfast, enjoy a boat ride to Cai Rang floating market, your boat will cruise through the market slowly as you could admire the colorful floating market in Vietnam Mekong Delta.The boat trip will fisnish at the local market so you will understand the different between floating market and Local market. 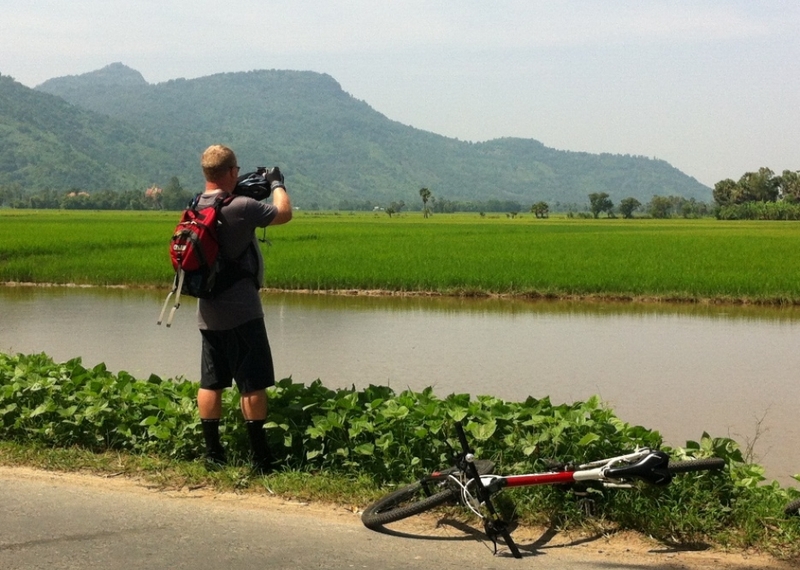 After that we will do stransfer out of the city for the cycling to Travinh. 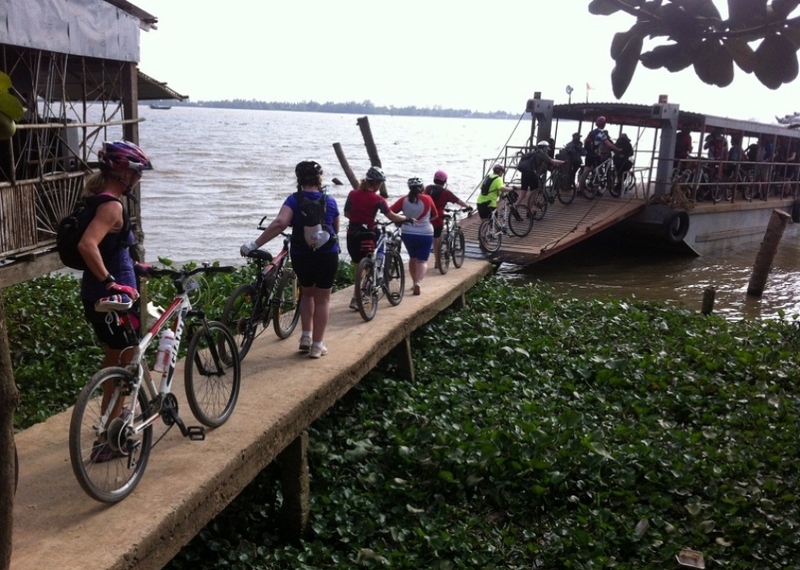 the cycling will start with ferry crossing to island we to see and experience the rural life of the local people .after that do the anothe ferry crossing get back to mainland and continue cycling on narrow country lanes to visit Khmer temples in countryside of Tieu Can. Right here, you can see the living activities of Khmer community in Vietnam. 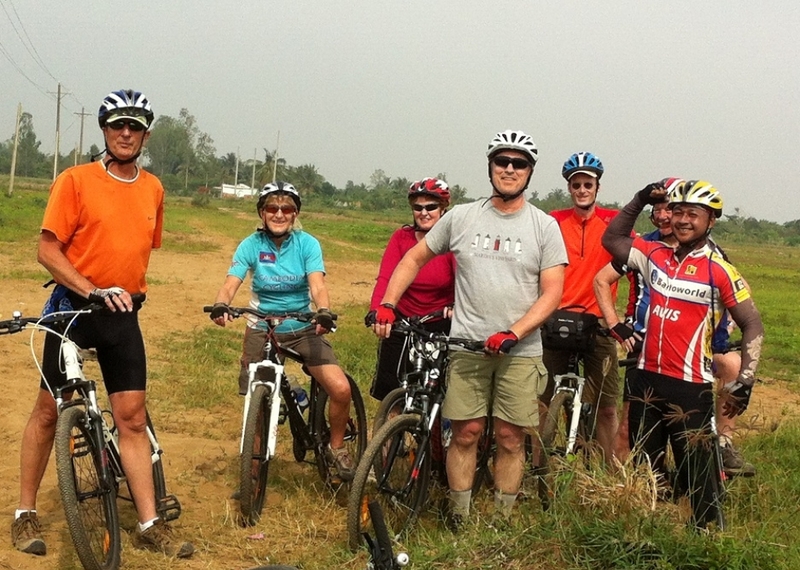 Continue pedaling on rural roads to Tra Vinh. Overnight in Travinh .